Disclosure: Since I spent a LOT of time reviewing The Cobus Method, I would appreciate your support in buying lessons through a link on this page. You won’t pay a cent more, but I’ll receive a commission for my time writing this in-depth review, which helps fund this website (and my drum building obsession!). Thanks! Cobus Potgieter (don’t worry, I can’t pronounce it either) came upon the drumming scene in 2006 when he posted his first Youtube video drum cover of “Pop” by N’sync. This video quickly became a top viewed video on Youtube and now has over 3 million plays. There are 15 DVD’s and 5 CD’s!!! That’s soo much content! I wonder how long it will take me to watch all of these DVD’s… hehe. Cobus’s use of the word “redonk-ulous” is pretty hilarious. EDIT: Cobus has lots of interesting/funny sounding words he likes to use. Crazy South-Africans. The way Cobus explains theory is incredibly simple, I’ve been playing drums for 16 years and felt like his explanation of time signatures, and note values was easier for me to understand than ever before. This dude is totally self taught, and really good. The Cobus Method really is a method. Cobus has a specific way of learning drum songs, and a specific way of teaching them, and he is very well spoken and knows what he is talking about. Appetizer, Drink Pairing, Main Course, Pudding, Cup of Coffee, Chef Fishing for Compliments, Breathe Mint – Really great analogies that Cobus uses to describe song structure. The way Cobus explains how to listen to other instruments for melodic cues during a song is right on. Yuca sounds like a band I might like. As long as you get the feel of the song you don’t necessarily have to play ever fill verbatim. It’s pretty cool watching Cobus learn a song and play through perfectly 10 minutes later. The Udrum kit that Cobus plays in the videos sound really good, as well as his TRX cymbals. The “Grid” is a great way to explain creating drum beats and fills, and extremely easy to understand. These words of wisdom from Cobus about writing with a band will save you lots of time and heart ache. Leave you ego at home, serve the song. One of my favorite parts so far: Cobus sharing some of his “signature beats”. Getting to see a band writing session with Cobus and the other musicians playing off of each other and collaborating is inspiring, and really shows how a drummer should approach writing with a band. The “Herta” is an awesome hybrid rudiment to throw into fills. I might have a new favorite part of the DVD’s: Cobus sharing and explaining some of his “signature fills”. He uses lots of these in his Youtube videos. I actually played one of Cobus’s signature fills without even knowing it…but he actually knows how to use it! Check out the video of me playing this fill! After watching all of the DVD’s I can honestly say that this really is an incredible product. I will need to actually re-watch some of the lessons when I am sitting next to my drum set and can try out some of his signature fills and beats. Overall, this DVD would be good for begging drummers and advanced drummers. Cobus starts from the very simple things of drumming, and ends with some ideas/beats/fills that will challenge the seasoned drummer. Well. That is my take on the Cobus Method. I love this drum lesson package. I will be re-watching the videos over and over again soon. That’s the great thing about these drum lessons; you pay for them once and you can watch them whenever you want to, over and over again! If your interested in learning more about The Cobus Method, check out the site by CLICKING HERE. 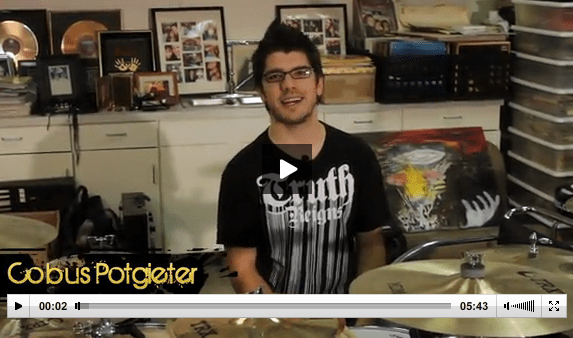 – There are lots video clips from the actually DVD’s on his site that let you see the drum lesson package before you buy! Check it out! What do you think about Cobus? I just bought the cobus method and watched a few lessons, it’s so incredible the way he has to explain, i have a basic english level, ant yet it’s totaly comprehensible. He use a basic vocabulary with simple exemples. It’s certainly a must have for drummers wich want to learn by themselves. Hunter, Thanks for the feedback! It’s awesome to know that even with a basic English level that you are able to understand the lessons and benefit from them. Good Luck! [..YouTube..] I bought mine about 5 days ago, I still just have the online edition and I´am waiting for the phsycal version, to be shipped. I will be brief for what I have seen so far.1.- You get an online and a physical version2.- You get a live lesson each week3.- I´ve benn playing for 10 yrs and now i give grum lessons and the drum theory and how to train your ears help me out for improving mine teaching abilities.Conclusion Helps yo understand drums in a very simple way. I bought mine about 5 days ago, I still just have the online edition and I´am waiting for the phsycal version, to be shipped. I will be brief for what I have seen so far.1.- You get an online and a physical version2.- You get a live lesson each week3.- I´ve benn playing for 10 yrs and now i give grum lessons and the drum theory and how to train your ears help me out for improving mine teaching abilities.Conclusion Helps yo understand drums in a very simple way. [..YouTube..] drink every time you hear the word “dude”. drink every time you hear the word “dude”. I got mine a few weeks ago. I’m IN LOVE with every single detail. As you said, he explains everything in a very understandable way, he makes it easy for everybody. If I loved drums before, now they’re my addiction. I’m definitely not sending it back! Thanks for the comments! I’m glad yall feel the same way I do about Cobus! The “dude” rocks. [..YouTube..] Thanks for the comments! I’m glad yall feel the same way I do about Cobus! The “dude” rocks. [..YouTube..] Cobus is not the Big Lebowski. Cobus is not the Big Lebowski. For anyone who is serious about investing in or searching for a TRX training review, then take hold of a chair, grab a seat and read every single word in this article because this is the information you have long been hunting for. How long did it take you to watch all of the 15v DVD’s? [..YouTube..] How long did it take you to watch all of the 15v DVD’s? “dude”just ordered that box set today “dude”. It will be here on the 20th “dude”. great video thanks for the info im gonna get that.